How Much Compensation Can I Claim For An Injury Causing A Facial Scar? Scars are considered to be ‘secondary injuries’, as scars can arise as a result of a plastic surgery going awry. However, for some people, their scars are the result of malicious attacks, road traffic accidents, or from coming into contact with hazardous substances. Most scars do not prevent a person from performing their jobs, physically speaking. Emotionally and psychologically speaking, scars can have devastating effects on an individual. 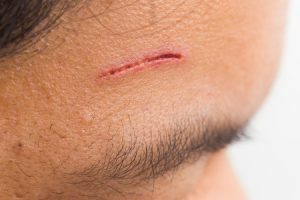 If you have received a facial scarring – through no fault of your own – you may be able to file a facial scar injury claim and receive compensation. A guide to facial scar claims. What is a facial scar? Claiming for a facial scar caused by a road traffic accident. Claiming for a facial scar caused by a fire. Claiming for a facial scar caused by an assault. Other common accidents that result in a facial scarring claim. Claiming for facial scarring due to an accident at work. Claiming for facial scarring caused by medical negligence. Claiming for facial scarring caused by an accident in a public place. Facial scarring facts and statistics. Assessing the severity of facial scarring. The psychological effects of facial scarring. What to do if you suffer from facial scarring due to an accident. What can be claimed for after an accident causing facial scarring. No win no fee facial scar claims. How much compensation per stitch. How much can I claim for a facial scar? How to start a facial scar claim. Why choose us as your claims service for a facial scar claim? The purpose of this guide is to provide you with all the information you will need to file a claim for your facial scarring. In this guide, you will learn of the many conditions that cause facial scarring. This guide also intends to answer any question you may have as it pertains to facial scarring. A frequently asked question is “how much is a scar worth”? As you continue to read this guide, you will discover how much you may be compensated for your scar and the factors which will influence the final amount. Lastly, this guide will inform you of the steps that are needed to file a claim for facial scar injuries and issues. If you still have any reservations about filing a claim, please feel free to contact one of our representatives who can help to clarify any issues you may have. Our contact information will be provided at the end of the guide. Facial scars can be the remnants of either a surgery (especially if it has been performed badly) or can be the result of some kind of accident that has left an unsightly mark on the face. Typically, facial scars do not physically prohibit an individual from working. However, the scarring can have a considerable emotional and psychological impact on the individual. If the scarring has occurred as the result of negligence on the part of another person, you may be owed compensation. It is not uncommon for a Road Traffic Accident (RTA) to cause facial scarring. If you have received a facial scarring as a result of an RTA, the person who will be held responsible for any injuries that have been sustained will be the person who caused the accident. This could include, for example, another driver. Drinking while Driving – Drinking while driving is not only against the law but is extremely dangerous for all involved. Drinking while driving not only can cause accidents but also can result in the death of an individual. Poor Road Condition – The condition of the road can have a huge impact on an individual’s driving ability. Poor road conditions can result in a driver losing control of the vehicle, causing an accident. Reckless driving – The person behind the car could have either been speeding or driving recklessly. Failing to judge a person’s path – This is an accident in which a person could have misread the direction a car was going and – as a result – had to swerve. As a result of the swerving, the driver could either lose control or collide with another car. In the scenarios above, the person deemed responsible for the accident might be the driver(s) and/or the road conditions. In either case, you may be able to make a claim for your injuries. In this kind of scenario, you will file for a Road Traffic Accident claim. Laser hair removal – Laser hair removal, when a problem occurs, can result in second or third-degree burns, resulting in hyperpigmentation and/or skin discoloration. Chemical exposure – Chemical substances can have devastating effects when applied to the face (and any other part of the body). Fire-related car accident injuries – There are incidents where a road traffic accident results in the car being engulfed in flames. As a result, the person inside the car may sustain facial and bodily burn injuries. In this incident, the person will most likely file for an RTA claim. In the scenarios above, the people who will be deemed responsible will be the medical practitioner, the occupier of the building where you were exposed to the chemical substances, and (potentially) another driver, respectively. In the scenario with the laser hair removal, you will most likely file a medical negligence claim. In the instance of chemical exposure, you will most likely file for an industrial accident claim. Finding the negligent party can be easier with legal advice. Acid throwing – Acid attacks have tripled in the past six years in the UK. Acid attacks cause severe facial disfigurement along with extreme emotional and psychological anguish. Physical attacks – A deliberate attack by a perpetrator to inflict some kind of harm on you. Animal attack – A person commands their dog or animal to attack you or if the owner is aware of their dog or animal being vicious and have given no means of restraining the animal. In the situations above, you may be able to file for a criminal injury claim. In the case of an animal attacking you – but without the intent of the owner to harm you – you might file for an animal accident claim. For clarification regarding your case, we recommend discussing the matter with a legal expert. Surgical procedure – A surgical procedure which has not been performed correctly can leave facial scarring. Animal attacks – An attack by an animal whose owner didn’t command it to attack. Slip and fall – These are very common in many environments. In a situation like this, depending on where you slip, you may be compensated for your injury by the owner or occupier of the place where you received your scarring. Hazardous liquid – In many industrial buildings, there are many kinds of hazardous liquids and chemicals that can cause severe scarring and disfigurement of the face. There is a multitude of ways in which you can receive a facial scar and many ways in which you can be compensated for the scarring. As long as the scarring you received is no fault of your own, you may be able to be compensated for your injury. Securing the health, safety, and welfare of persons at the workplace. Protecting persons, other than the persons at work, against risks to health or safety. Controlling the use of chemical substances and explosive or highly flammable materials. Under this law, an employer is responsible for maintaining a safe environment for employees and is required to follow the laws. If they are found to be in breach of these laws, they may be required to pay compensation. Workers compensation for scars is usually influenced by the severity of the disfigurement and is paid by Employers Liability Insurance. It should be noted that many worker’s compensation claims will pay for a permanent scar compensation claim. Facial Scars are not un common with accidents at work their are many things in the workplace that can cause facial scars. An excessive amount of skin removal during an operation. Using the incorrect equipment for making incisions. Using the wrong type of stitches. Taking photos – It is important that you have photos of yourself prior to the incident – which will be of great use – as well as the photos you take after the incident, which can show the severity of the disfigurement. Get a medical examination – Getting a medical examination from another medical practitioner will be of great use, as the medical practitioner will be better equipped to outline in great detail the incorrect techniques the other medical practitioner used in performing the surgery. Reach out to a solicitor – This last step is important, as the solicitor will be able to help you in filing a claim. Medical practitioners who have been deemed responsible for your facial disfigurement may have their license revoked while you can be compensated for your pain, suffering, and emotional anguish. The premises may include retail stores, supermarkets, car parks, and libraries. It can also include places managed by the local authority such as pavements, playgrounds, canal footpaths, and pedestrian bridges. For example, if you have received a facial scarring from a slip and fall at the local park as a result of uneven pavement or an unfit playground, you will be able to be compensated. Claiming compensation in a public area can be a difficult task. It is recommended that you seek legal advice for further clarification. The UK Government describes the responsibility of occupiers in full. It has been estimated that close to 23 million adults in the UK have some form of scarring. Although many of these scars are minor and barely noticeable, there is estimated to be nearly a million adults who have noticeable scars. Many facial scars do not interfere with the physical performance of individuals. However, these scars have a considerable effect on the mental, emotional, and psychological well-being of individuals. As a result of the emotional stress that individuals with facial scarring experience, the courts have recognised the emotional and psychological suffering these individuals endure and have made it possible for them to be compensated for their suffering. When assessing the severity of your facial scarring, it is of the utmost importance that you visit a medical professional and receive a thorough examination. This medical examination will be able to outline – in great detail – the severity of the scarring and how it has affected your life (typically in a negative way). If you have not yet visited a medical professional then we can arrange for a medical exam at a local medical facility. As we will see in a later section, the severity of the injury will have a huge influence on the amount of compensation which you may be paid. Typically, the more severe an injury is adjudged to be, the higher the compensation amount will reach. As such, a thorough diagnosis helps to maximise the amount of compensation you are paid. The psychological effects of facial scarring can have a significant impact on a person. For those who sustain facial scarring, it is not uncommon for them to suffer from depression and other mental health conditions. Medication and speaking with a psychologist are usually the remedies that are offered, though this can vary from patient to patient. As well as the physical after-effects of an injury, dealing with (and being compensated for) the psychological effects of an injury are vital. With a condition like facial scarring, this is particularly true. Feel free to contact our team today for additional information on this matter. Collect evidence – If possible, take photos of the place where your facial scarring occurred. Take photos of any item(s) that caused the scarring. After taking the photos, get witness testimonies. The witness testimonies will be very useful in filing your claim. Arrange for a medical examination – After you have attained the necessary evidence, you should arrange to meet a medical professional who will be able to assess the severity of the scar. If needed, we can arrange an appointment for you. Document financial losses – It is important to keep a journal of all the expense you have incurred as a result of your scarring. Keeping a record will prove to be very useful during the claiming process. General damages – for the scarring you have received, along with the mental and emotional anguish you may have experienced since the accident. Special damages – for the one-off, special costs, such as property affected by the accident. Medical expenses – for any medication, equipment, further surgery, or private health care that was needed. Travel expenses – for any travelling that was required. For example, if you had to fly to another city to see a specialist doctor. It is important to document all of your expense as you may be able to get them back by filing your claim. We understand how filing a claim can be burdensome for people whose income and financial security has been affected by their injury. That is why we offer a ‘No Win No Fee’ agreement, or a Conditional Fee Agreement (CFA), that can help to ease the worries of individuals who concerned about the process. When battling for face injury compensation, it allows you to work with our fantastic team of legal experts without the need to worry about the monetary risk. If the case is successful, we can take our costs from the final settlement. If it is not successful, we will not. This ‘No Win No Fee’ approach is part of our commitment to offering dependable, ethical, and reliable legal assistance to any and all prospective clients. The amount you can hope to be compensated for your stitches depends on the circumstances surrounding the medical procedure. Claiming for stitches is quite difficult, as the issue of stitching type (such as dissolvable stitches) can complicate matters. The one stitch facelift – which costs in the range of £2,695. Ear correction surgery – which costs in the range from £2,500-£3,500. Rhinoplasty – which costs in the range of £4,500 to £7,000. Should you receive a scar as the result of poor stitching in these situations, you made be paid according to the extent and the severity of the issue. Often, this can include a pay rate that depends on the number of stitches. For more information, contact a legal expert today. Facial Scarring (Female) Very Severe £36,800 to £74,000 The scarring is so severe there is still disfigurement even after plastic surgery. Facial Scarring (Female) Less Severe £23,000 to £36,800 The scarring has left moderate to severe disfigurement. Facial Scarring (Female) Significant Scarring £13,650 to £22,875 The scars are visible at conversational distance. Facial Scarring (Female) Less Significant Scarring £3,000 to £10,450 The scarring is not particularly noticeable, but upon inspection it is noticeable. Facial Scarring (Female) Trivial Scarring £1,300 to £2,675 The scarring is barely noticeable. Facial Scarring (Male) Very Severe £22,625 to £50,000 The scarring is so severe there is still disfigurement even after plastic surgery. Facial Scarring (Male) Less Severe £13,650 to £22,875 The scarring has left moderate to severe disfigurement. Facial Scarring (Male) Significant Scarring £6,925 to £13,650 The scars are visible at conversational distance. Facial Scarring (Male) Less Significant Scarring £3,000 to £6,925 The scarring is not particularly noticeable, but upon inspection it is noticeable. Facial Scarring (Male) Trivial Scarring £1,300 to £2,675 The scarring is barely noticeable. As the scar compensation calculator shows, the amount you can be awarded in your facial scarring compensation depends on the severity of the scarring. If you are still uncertain about your scarring and how it pertains to the amount you may be awarded, you can reach out to one of our solicitors to discuss the matter in further detail. After you have acquired all the evidence you need and have met with a doctor, the next step is to begin your case. Finding a solicitor can be a very stressful endeavour; this is why we offer a free consultation that will help to inform you of the best available options to take. The free consultation we offer can prove to be very useful to those who aren’t familiar with the legal process. If you choose to work with us in filing your claim for your scarring, we will be more than willing to begin your case. If you haven’t seen a doctor than we can arrange for you to see a local specialist. Once you decide to work with our team, we’re able to handle the vast majority of the work involved with your claim. If you’re wondering how to get started, calling our offices is often the easiest way forward. If you have suffered an accident which has resulted in facial scarring, you may be owed compensation. We offer a wide range of benefits for any potential claimants, from a free consultation to arranging medical exam, to a ‘No Win No Fee’ agreement. We pride ourselves on our strong work ethic, our friendly atmosphere, our level of integrity, and our strong relationship with our clients. With our impressive success rate and ability to maximise the compensation settlement you receive, we really are the perfect choice for any kind of claims process. If you would like to find out more, you can contact our team at any time. We offer a free consultation to help you decide the best options to take regarding your compensation claim. Feel free to contact one of our solicitors, either using a web chat, filling out an online contact form, or calling 0800 073 8804. We look forward to hearing from you. The NHS on treating scars guide, scar victims seek help for scars if they are painful or to find away to allow the car to heal better for more information visit the NHS link. This NHS page explains exactly what a scar is, Scars are a natural part of the healing process. Have you had a accident at work that has caused a scar injury? find out how much compensation you can claim contact us today for free legal advice.